Sarah Bear Crafts: Indie Gift-Along! 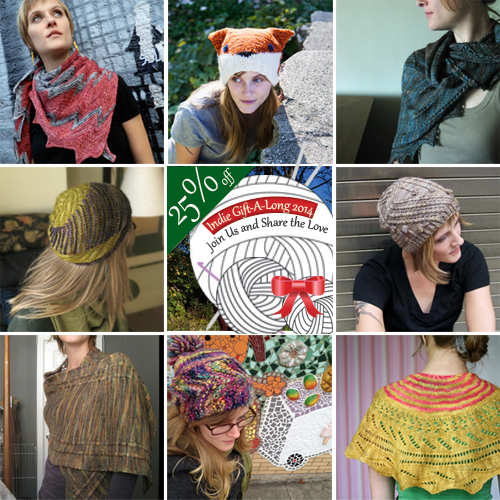 As knitters, we have a tendency (and need) to think about Christmas gifts months in advance. As a designer, I get a warm, fuzzy feeling every time a design of mine flies off the page (or screen), onto someone's needles, and into gift-wrapping. Even though I'm not there for the gift-giving, I love to imagine that's what happens when someone buys my pattern. Last year, a crew of independent knitting- and crochet-desginers created the "Indie Gift-Along." It's essentially a group in the Ravelry forums that is dedicated to bringing knitters and independent designers together to make gifts for loved ones, and to share pictures with one another as they work. I couldn't be more excited to be one of the participating designers this year! Thanks to all the tireless volunteers who organize this (including Alex Tinsley and Nina Machlin Dayton), I get to be a witness to the gift-giving process, as well as get to know the work of so many amazing independent designers. I know I'm a day late to report this, but for the next 7 days (ending November 21, 2014), 20 of my patterns will be on sale for 25% off! Simply use the code, giftalong2014! By all means, take advantage of the sale, and plan ahead for the Indie Gift-Along this year!